We enjoy burning wood for heat in the winter. It is a lot of hard work to cut, split, and stack, then go out in the cold and get bundles of wood into the house. I have a canvas carry bag that carries several sticks of wood. Since I want to make the most of every trip I tend to load it up until it is a little bit heavier than I really want to carry. That makes it hard, and, it is dirty. When bringing it in and loading it in the wood bin, and taking it out of the bin to put it in the stove, debris falls off in the floor. Then when you burn it, and remove the ashes, a fine dust settles on the stove and surrounding area. Also, anytime the babies come to visit, the screen goes up to keep them away from the hot stove. But you know what? We still like to burn wood for supplementary heat. It just seems like there is nothing like being able to back up to a wood stove and get toasty warm all over inside and out. We also enjoy the evenings, to sit down and relax with the fire flickering through the window of the stove. So, one day, in the process of cleaning the ashes out from the stove, my shovel kept hitting something which seemed like something other than the normal remaining small chunks of coals and ashes. As I dug around to lift it out I found a small piece of barb wire in my little shovel. It had been embedded in a piece of wood that the chain saw had fortunately missed. It was hidden down deep, never to be seen except for when it was all put in the fire. The fire will reveal the hidden things that are buried deep as it burns away what covers it up. That tree had the barb wire attached to it so long that it slowly grew around it so it was imbedded and unseen. This happens to us sometimes. 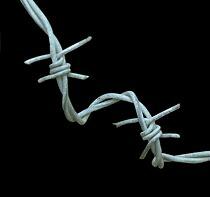 We make choices allowing the barb wire to be attached to us so that it becomes part of our personality. Self- imposed barriers and restrictions and foreign, injurious, thoughts and actions become imbedded. We are told that Jesus will baptize believers with the Holy Ghost and fire (Matthew 3:11). There is a working of God in our lives in which we not only have our present sins forgiven and washed away, but he will go deeper and reveal the inward causes, if we will allow him to do so. He wants to set us free from the inside out. Deep wounds must heal over a period of time from the inside out. As we avail ourselves to him, and immerse ourselves in his powerful Word, he is faithful, he will heal us. As we pursue and allow the fire of his Word and Spirit to burn in our lives, and pay attention, we will be able to see and understand and receive freedom. He will speak to us personally in our heart and mind, or he might speak to us through somebody. Either way, God is merciful and faithful to those who will come to him believing. As the fire to the wood revealed the wire, so will the Holy Spirit reveal and free us from our hidden barb wires.